Firebrand Theatre partners with Timeline Theatre Company to present Caroline, or Change. 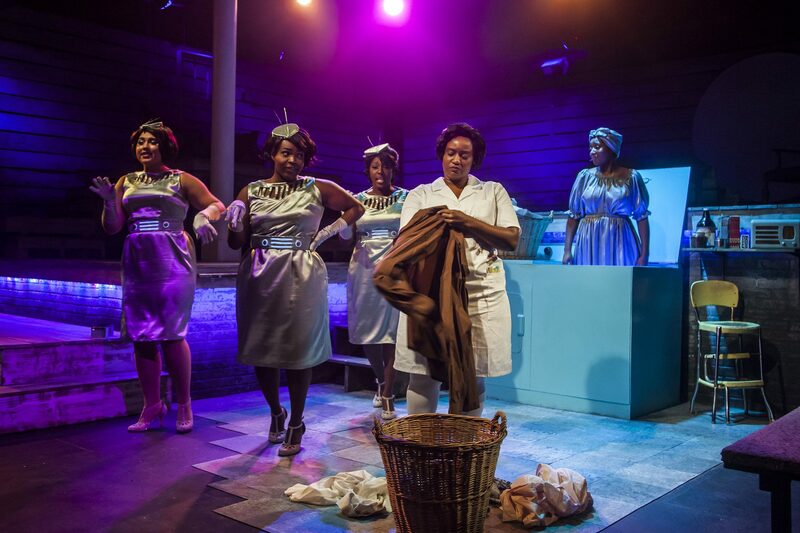 Tony Kushner’s autobiographical musical about an underpaid black maid and the white Jewish family she works for, depicts the growing pains of a changing Louisiana in 1963. The partnership of these two theatre companies seems only natural. As the self-proclaimed “world’s first equity feminist musical theatre company,” Firebrand is demanding the kind of change that this musical is yearning for. Timeline’s signature lobby display leads the way to the stage. Paired with a mobile app and a physical piece of audience engagement, I feel overwhelmed by the breadth of information. The lobby display’s sensory overload is swept aside once I turn the corner and see the moon. The clarity of Lauren Nichols’ scenic design is striking. In corner-stage orientation, the household is nestled and sliced open. The wood paneling and well-worn detail promote a warmth in this Louisiana household. Cat Wilson’s clever lighting design is incorporated into the set, sewn into costuming, and paired with props. Fairy lights peek through the panels of the wall and through the dress of a personified moon to create a seamless wall of stars. Music eventually rumbles from beneath the floorboards, but before the orchestra begins, Rashada Dawan descends as Caroline Thibodeaux to the basement of the segregated performance space. The upper portion of the multi-tiered set is occupied by the white characters, while the black characters are resigned to the lower performance space. The white family travel freely along the set but only once are the black characters allowed enter up high during a dinner that they are serving. This subtle blocking choice tells an important part of this story that underlies all the relationships in this musical. The younger performers in the cast perform childhood while balancing a required depth. Bre Jacobs plays Emmi Thibodeaux, Caroline’s daughter with a mind on revolution and Alejandro Medina charms the audience in his first few lines as eight-year-old Noah Gellman. The two main maternal figures play against each other beautifully. Caught between step-mother, daughter, and wife, Blair Robertson shines as Rose Gellman. This parallels a simmering performance by Rashad Dawan as the titular Caroline. The hallmark of this production is the relationship between parents and children and these generational tensions were skillfully crafted by director Lili-Anne Brown. Change comes fast, and change comes slow, but time flies as two and a half hours becomes unrecognizable. Andra Velis Simon’s music direction drives the entirely sung production. Rashada Dawan injects the production from the get-go with a soulful hum that seems to bring everything to life from her radio to her washing machine. The voices of the performers only grow stronger throughout the evening. As tensions rise, and the heat from the basement dryer builds, Rashada explodes in her performance of “Lots Wife.” By the end of the song, the intimate Den theatre is still. When I exit, the air is a good ten degrees colder in the lobby. On one of Chicago’s coldest nights in a while, I feel warm in that theatre. In the background of the 1960s plot is this story of a Confederate statue gone missing. This feels remarkably familiar. In fact, there’s a lot in this play about the past that feels present. While the value of $20 has changed, wage discrepancy certainly hasn’t. This realization doesn’t leave me depressed but hopeful. Sure some things, some very important things, haven’t changed… but that doesn’t mean they can’t. The dreamlike magic that personifies appliances and the moon herself makes me believe in anything. Even change. It feels inevitable. The newly formed Firebrand Theatre makes its mark with musical Caroline, or Change directed by Lili-Anne Brown. This musical is complicated; it’s messy. In typical Kushner fashion, it doesn’t give viewers everything you want wrapped neatly, in typical Kushner fashion. There are problematic issues with the story, yet at its core there is something to be discovered. What happens if we do not change? What happens when we don’t know how to get out of our own metaphorical hell? And what happens if we believe that change is a privilege? What makes this show unique is Firebrand itself. One of the spectacular things about Caroline, or Change at Firebrand are its technical elements. There are simplistic, yet big spectacles sprinkled into the show that leave audiences on the edge of their seats. I could feel the audience that night leaning in the night I attended. The lighting, designed by Cat Wilson, literally steals the spotlight, making it unimaginable to see a staging of Caroline, Or Change without the use of deep reds, blues, and purple hues. These colors are used to further illuminate the shows core themes and Caroline’s inner thoughts. Another gorgeous aspect of Firebrand’s technical staging is in the costumes designed by Kotryna Hilko. The designer uses the language of the play to construct and design her costume as a metaphor. A highlight was the electric “radio” costumes in act two, they made sense within the world of the show and Caroline’s view of the world. The show did have its tech flaws, like the constant fumble of mics, and sound levels. The biggest issue was diction with the cast in a few songs, this might have been through the fininicky mics and high pitches. However, diction is essential, and for the first few minutes of the show it was hard to hear what actors were saying. Yet the team managed to fix it, and by the second act there was a better change. The story does have slow lags when divulging storylines, for example the seven minute song “Roosevelt Petrucius Coleslaw”. The high quality singing in the show excuses these slow moments, specifically the voices of Rashada Dawn, Nicole Michelle Haskins, and and Michael Lovette. The music of the show is evocative and looming, and provides a strength that most musicals don’t carry. Audiences might not like every message in Caroline or Change, but it makes us reconsider our own grudges and biases. It’s also remarkable how the musical feels like it was written this year. Caroline or Change at Firebrand has a vibrant cast, talented voices, and thoughtful technical design. It’s great for the musical lover, and smart enough that anyone could enjoy its complexities. Give this new, yet impressive, theatre company a chance, go see the show and have a complex conversation afterwards. When we meet Caroline (Rashada Dawan), a domestic technician for a seemingly average Jewish family, we know something is building. In this Civil Rights era production, race and class are at the helm of the tension, but much of the strife lay at the feet of naiveté—ignorance of how people that are different from you live. Caroline, or Change is the loose autobiographical musical of Tony Kushner’s childhood, which made its Broadway debut in 2004. Much has happened since then, yet this piece still feels sorely relevant for a country facing a major identity crisis. At its core, this is a show about two families living in Louisiana, but the relationship here is transactional as one family wields more power, amplified by paychecks and the color of their skin. The Gellmans are made up of a widowed father, Stuart, and son, Noah, and the newest member, wife and step-mom, Rose. Opposite them is Caroline Thibodeaux, a hardworking mother, and sole provider to her three daughters. Under the expert direction of Lili-Anne Brown, these characters are staunch in their respective points of view, further amplifying how their needs differ. Rose (powerfully portrayed by Blair Robertson) is a city woman thrown off-balance by a new life in the country. Though trying her best, she steps on herself when attempting to be helpful. When juxtaposed to the trials and tribulations of Caroline, the gap between class and race struggles is painfully exposed. Here, their energies clash and their priorities are of obvious different weights. Rose simply wants Noah to like her. Caroline is a struggling breadwinner. Yet, Brown deftly teases these out and shapes the women into individuals. Caroline’s heaven and hell coexist in the Gellman basement, where it becomes clear that the sentient Supremes-like radio provides Greek Chorus-esque context to the audience and solace to Caroline. Dawan pours herself into Caroline so fully, so wholly, that we, the audience, want to go up and aid her in the housework. Caroline spends much time with the laundry, similarly serenaded by the washer (Tyler Symone) and dryer (Micheal Lovette), each adding a powerful voice to an already sonically dynamic production. Each character is almost of a different genre, ranging from blues to classical to Jewish Klezmer. Music Director Andra Velis Simon fills the space, despite Jeanine Tesori’s challenging score of varied genres and opposite styles. For Firebrand’s most ambitious production since its recent founding in 2015, The Den is a curious choice of space for a show that would benefit from a more intimate space. The set by Lauren Nichols works its way up the Gellman house from basement, to kitchen and living room, and further up and over to Noah’s bedroom. Though beautifully designed and furnished, there are times when characters seem farther from us and each other than necessary. Interestingly enough, it’s the lights (designed by Cat Wilson) that center and ground us in this world. Fairy lights serve as stars that surround the house and moon. The radio trio is further brought to life by delicate, belt-like lights, waist high within each gorgeous dress. A bus, which would otherwise look like a bell hop cart, is transformed with simple headlights. We know when and where we are even if the characters are generous with spacing. Nevertheless, the relationship to watch is the one between Caroline and the Gellman son Noah (Alejandro Medina), for which represents Kushner’s boy self. Here, we see Caroline through Noah’s eyes—she’s strong and loves her daughters, yet he struggles to grasp her downtrodden demeanor. But we know it’s her quiet rage, her frustration with where she is in life, albeit through no fault of her own. But how to express this to an eight-year-old? We ride the rollercoaster with them, hoping for the best but knowing most endings are not happy ones, at best we return back to the place we started. Caroline, or Change takes place on a multilayered wooden set, with different platforms representing different floors in a cavernous house. As the show opens, we get an opening number where Caroline, the black maid of a middle-class Jewish family in Louisiana, sings through her daily routine. She is soon joined by members of the cast, playing personifications of the objects that surround Caroline as she works – the washer, the dryer, the radio, even the moon. The night I attended, Caroline was played by understudy De’Jah Jervai – and despite being far too young for the role, she manages to imbue Caroline with a great deal of pathos, at turns careworn, passionate, exhausted, and assertive. The show starts off a bit too slowly, and scenes in the first act feel overlong – Caroline, or Change is a very slow, methodical, character-based text with minimal plot, so some pacing issues are understandable. However, the talented cast is more than up to the task of slowly illuminating this world for us. As act one progresses, we see the Gellman family’s only child, Noah (Alejandro Medina), as he interacts with his dad, his stepmom, and Caroline – alternating between different levels of the house as he tries to process the wildly disparate advice from the adults in his life. This is one of the ways that Lauren Nichols’ set design, as well as illustrative blocking from director Lili-Anne Brown, help to accentuate the show’s themes, namely by taking the wealth disparities in the story and giving us a visual shorthand to better understand them. Caroline spends most of her time on the lowest, most downstage platforms – in the Gellman’s basement doing laundry, or else in the outside world, waiting for the bus or talking with her own children at home. Noah’s dad and Gellman patriarch Stuart (played with a charmingly awkward, mustachioed air by Jonathan Schwart) spends most of his time on the upper platforms, and seems very lost, spending most of his stage time noodling away on the clarinet and wondering where his life has gone. Stuart’s new wife Rose, meanwhile, stays mostly in the middle, in the Gellman’s kitchen and dining room. Blair Robertson compellingly plays Rose as a woman pulled in every direction, both as a New York Jew struggling to adjust to her new life in the south, and as a mother figure to Noah. Noah, meanwhile, flits up and down the entire set with the energy of a kid, his naiveté allowing him to glimpse what it’s like on different rungs on the socioeconomic ladder. Caroline, or Change is ultimately a story about the anxiety concerning one’s own place on that ladder – and the production makes you feel this quite viscerally. The Gellmans dwell on a higher rung, but they’re also more removed from the audience. It’s easy to empathize with them (especially for me, being the spawn of semi-affluent New York Jews myself), but harder to sympathize: Rose spends a hilarious amount of time fretting about how little they’re paying Caroline without ever giving her a raise. Luckily, Caroline’s struggle is kept at the forefront here, literally and figuratively. Through her interactions with not only the Gellmans, but her own friends and family, we are invited to ask questions that haunt both her and us: how should we fight racism and inequality when we’re so goddamn tired? Is it even possible to fight the system when you’re already fighting to stay alive inside it? Caroline, or Change seems a bit unsteady on its feet at times, mostly due to the aforementioned pacing issues, as well as some awkward choreography and sound mixing throughout. But the talented cast, gorgeous visuals, memorable music, and important questions raised make it a worthwhile watch. Going in to Caroline, or Change, I was excited to see a show about race in the US, and to see my first Frirebrand show, because of their feminist mission. Caroline or Change written by Tony Kushner and Jeanine Tesori follows a summer in the life of Caroline Thibadeaux, played by Rashada Dawan, a Black maid for a Jewish family, the Gellmans. The conflict of the play starts when Rose Gellman (Blair Robertson) decides to punish her new stepson, Noah (Alejandro Medina), by letting Caroline keep any change she finds in his pockets. This decision, while making Rose feel better for paying Rose only $30 a week, upends Caroline and Noah’s cautious but close relationship. The set by Lauren Nichols is made of wooden platforms which feel open, but structured enough to suggest a house and basement when needed. It also gives us a pleasant view of the pit here and there, which is especially nice in musical moments. The cast is full of strong vocal talent, and Dawan really uses her vocal skills to define the contrast between Caroline’s restrained dialogue, and passionate singing. The show does feel a little cramped in its space at The Den. Although the music was always beautiful, it was often difficult to hear or understand sung text when multiple people were singing. The blocking and choreography were sometimes set on a diagonal which made visual storytelling difficult to interpret from the side. It was also sometimes hard not to notice when choreography was missed or dancing fell out of synch, where in a larger theatre I would never have cared. Still, the biggest issue I had with the show by far was the text. The “or Change” in the musical’s title refers to the physical change which Caroline debates keeping, the social change happening around Caroline, and the personal decision Caroline has to make about whether or not she will change her own life. References to all three of these “changes” are peppered throughout the lyrics of the show but when it comes to narrative themes and character development, there isn’t much there. One trope people interested in understanding racism through media studies talk about is ‘The Matriarch’. The matriarch is the functional head of the family and her relationship with her children is often on display. She struggles with poverty and an extensive work schedule, teaches her children with tough love, and is herself emotionally scarred. Matriarch characters are often irrationally aggressive, either to comedic effect, think Tyler Perry’s Madea or Martin Lawrence’s Big Momma, or they are so controlling and destructive they serve as antagonists like the mothers in Jumping the Broom and Precious. The Matriarch sets bad examples for her kids, and is somewhat or wholly unfit to raise them. This trope is harmful because it identifies the mechanism of Black marginalization as incompetent Black motherhood, but it also presents the idea that certain kinds of Black women are unchangeably damaged and have no room for growth. Caroline Thibadeaux feels to me like a failed attempt to engage with and expand The Matriarch. Caroline constantly mourns her place in life, but she is stalwart and unable to take action to her own benefit throughout the show. Another secondary conflict places Caroline’s fearful deference in opposition to her daughter’s desire to fight racism. The show hovers around and zooms in on Caroline’s trauma, misery and stagnancy we never get the chance to understand how that connects to larger themes of racism in the show, nor what would help Caroline change her life, or her desires beyond not being unhappy. Throughout, I kept wanting the how to help us unfold her misery and trauma, but I never felt that we got beyond watching her mourn. All said, Firebrand’s Caroline, or Change is a good production of a musical I couldn’t get behind. If you go I would expect a lovely set and beautiful vocal performances. When it comes to use of the space and discourse on racism the show falls flat. I plan to keep my eye on Firebrand’s future offerings and I hope to see shows which can comprehensively explore and expand on gendered trauma and suffering, as well work which engages audiences to think about how gendered oppression works and can be resisted. Caroline, or Change runs at The Den Theatre until October 28th. Caroline, or Change features music by Jeanine Tesori (Fun Home, Violet), book and lyrics by Tony Kushner (Angels in America), direction by Lili-Anne Brown and music direction by Andra Velis Simon. Caroline, or Change features Rashada Dawan as Caroline with Roberta Burke as Radio 3, Kevin Grubb as Grandpa Gellman, Nicole Michelle Haskins as Dotty, Rosalind Hurwitz as Grandma Gellman, Bre Jacobs as Emmie, Michael Kingston as Mr. Stopnick, Princess Isis Lang as Jackie, Alejandro Medina as Noah, De’Jah Perkins as Radio 1, Blair Robertson as Rose, Jonathan Schwart as Stuart, Lyric Sims as Joe, Tyler Franklin as Moon/Washer and Emma Sipora Tyler as Radio 2.